With the release of Version 4.6 in 2016 it became possible to handle and print Composites (as formed in NeoComposite) and groups (as formed in NeoGroup) from within NeoPack. For the sake of simplicity, composite pages and group pages will often be collectively referred to in this article as 'group pages'. In addition references to NeoComposite and NeoGroup apply equally to CompositeBuilder and GroupBuilder. It also very important the reader make the distinction between groups from NeoComposite and NeoGroup and group images matched to a folder in NeoPack as used for memory mates for example - the latter are not applicable here. 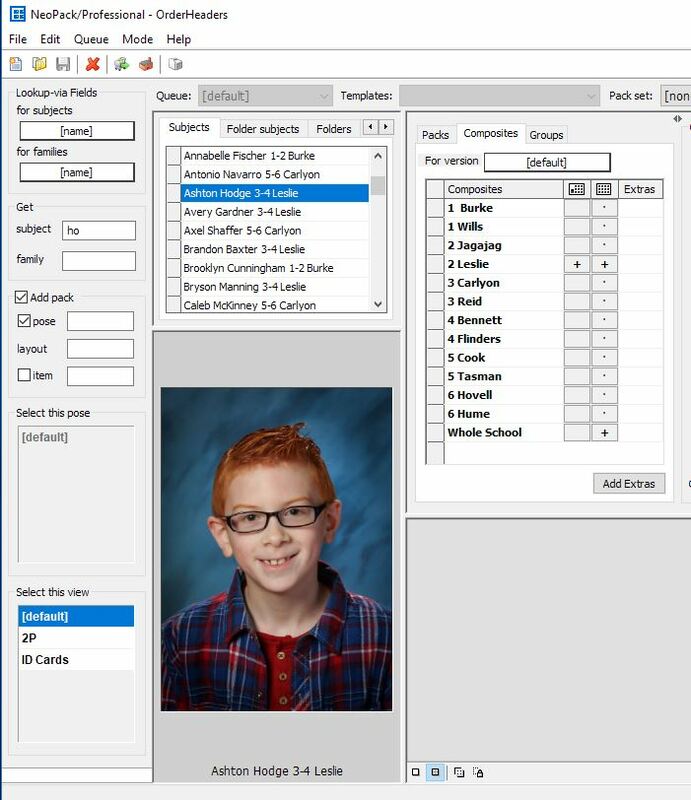 This new functionality means a subject's group pages, as ordered, are automatically added to the NeoPack print queue where they appear together with the subject's portrait packages. Version 4.7 expands on this functionality by allowing 'Point and Click' ordering of groups whereby the user can simply select a subject in Point and Click Mode and add their group to the queue without the need to enter an order for the subject by scanning a barcode for example. Moreover adding and printing extra copies of groups (as often required by a school for example) becomes a simple matter of entering the desired the quantaties of each group and adding them to the queue. Point and Click Mode in Version 4.7 introduces two new tabs sitting alongside the NeoPack template listing. However instead of listing templates these tabs list all the formerd composite and group pages. An understanding of this list and it's icons and functions is vital in Point and Click ordering of groups and with this in mind the reader is asked to study the screen grab below. The screen grab above shows a selected subject - Ashton Hodge. Note the + symbols in the Composites listing. 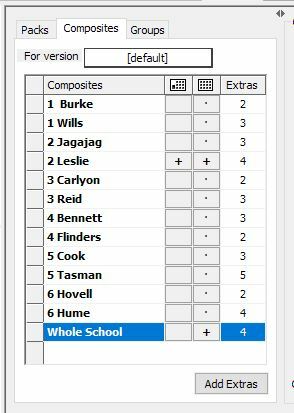 This indicates the groups that Ashton Hodge is a member off - a rotated and static page for the 2 Leslie composite as well as the static Whole School static page. Other composites contain a 'dot' symbol - indicating the selected subject is not a member of these composites. Though not displayed the Groups tab would list all NeoGroup groups for the job with a + symbol indicating groups the subject is a member of. A common need in both school and sports photography is to print extra copies of groups over and above those ordered by subjects. The new functionality in Version 4.7 makes it an easy matter to add these extra copies to the queue. This topic was covered at the 2017 Training Seminar. A recording is available at the Timestone Software You Tube channel.